My “problem” now is putting together enough paintings for my feature at Art in the Valley this coming October. 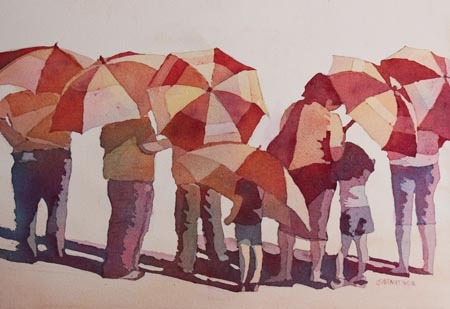 There’s a reason why artists like to paint umbrellas. They are shapely and brightly colored. They add grace to the human form. We associate them with romance and romantic cities. And here I live in the Willamette Valley were it rains all winter, and yet I’ve never really painted umbrellas and now when I do it’s umbrellas used for shade. Why? Because Oregonians hardly ever use umbrellas. We either ignore the rain with a macho sort of only wimps think this is rain air, or we wear sports gear with hoods. On the coast we have some excuse as the rain there so often comes with enough wind to invert any umbrella, but here in the Valley we hardly ever have real wind yet we don’t use umbrellas. 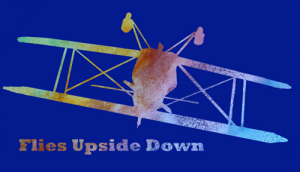 Our family does keep a couple collapsibles in the car, but we tend to forget we have them. These are Oregon umbrellas lent by the exhibit sponsor to the line of people waiting in the sun to see the Titanic exhibit some years ago. I embarrassed my young daughters by taking pictures of the line of people with all those beautiful umbrellas. One of my girls looked at the painting and said instantly that was when we saw the Titanic. She doesn’t remember being embarrassed, just the pretty umbrellas. My other girl is younger. She does not remember at all. Neither girl remembers many Oregon umbrellas. They associate umbrellas with London. A couple days ago, I saw a friend’s painting umbrellas in Rome, and thought to myself, I wish I had some umbrellas to paint. And then I remembered how I had embarrassed my children by taking photos of people standing in line because the umbrellas were so pretty. My painting doesn’t have the lovely rainy reflections Marsha’s does, but I do have shadows. 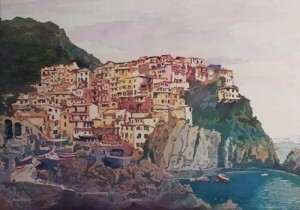 We visited the Cinque Terre or Five Lands in 2012. Clinging to the the cliffs about the Italian riviera, these charming wine and fishing villages are an Italian national park and a tourist magnet during the summer. 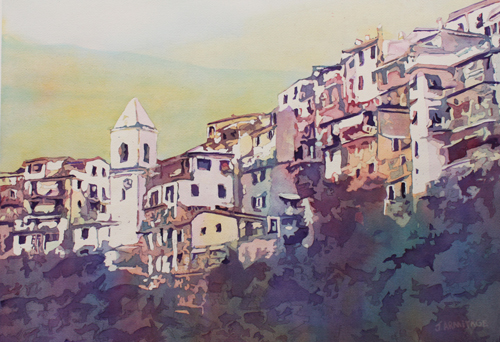 I painted Monterrosso, the largest of these villages last year. This is Riomaggiore, the smallest of the Cinque Terre, and the first village many tourists see. It was the first village we visited. And yes we were charmed by it’s pocket sized harbor and steep narrow streets. But these first paintings are not of the houses on the harbor cliffs, but the vineyard hills. 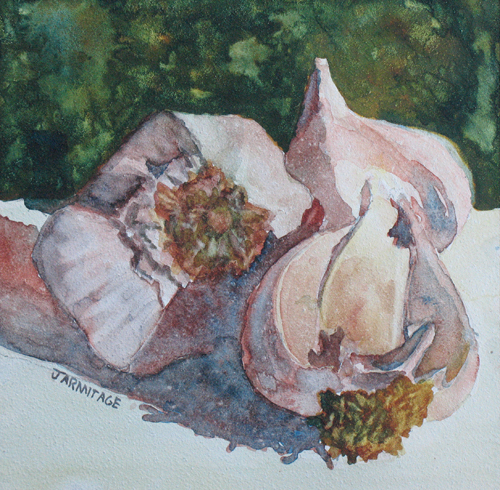 These paintings have sold, but you may still purchase fine art prints here. 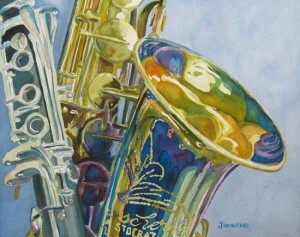 These two little instrument paintings were done at very different times in very different moods. I began “Midnight Duet” yesterday afternoon and worked late into the evening to do it. Given the painting’s dramatic night time lighting that seems appropriate. 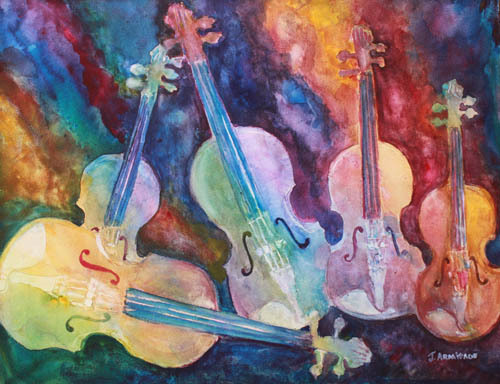 “Noon Trio,” I began on vacation in the early morning. I think of it as the bear painting though there are no bears in it. 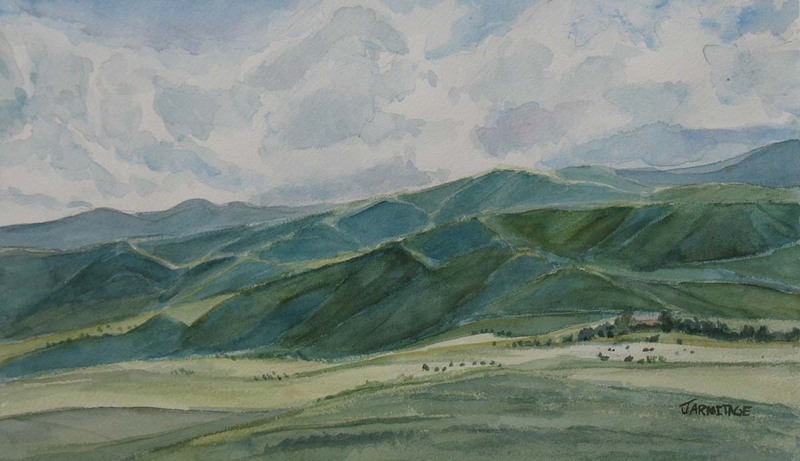 I painted it at my brother’s woodland house above Albuquerque, which he had kindly lent us for a couple of nights. I was working at the dining room table engrossed in the trumpet when a bump against the window caught my attention. That was as close as I’ve ever seen a live bear. He as only about six feet away peering curiously in. I wasn’t terrified, but I felt very, very alive and my brain when into hyper-drive. The windows on the bear’s side of the dining room were closed, but just on the other corner they wide open. So I stood up to close them, and the bear turned and lumbered away looking back over his shoulder just before disappearing into the forest. I closed the rest of the downstairs windows just for good measure. Prints of both paintings are available here. Once more we are headed out for adventure. 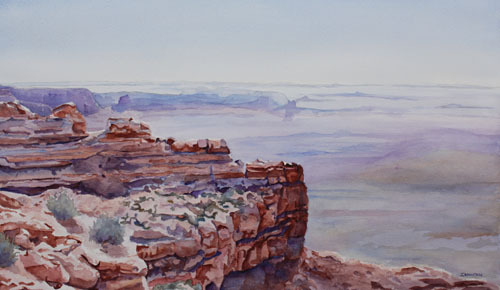 This time to the Four Corners and the canyon lands of Utah, Arizona, and New Mexico. I have my camera and sketchbook in hand. I hope to come home with scads of painting material and a few postcard sized paintings done on site. In the meantime, while prints, and Zazzle goodies will continue to flow, I will not be able to mail paintings until I return. Our house sitter is a gem: she waters; she feeds the dog; she gets the mail; but alas, she does not mail paintings. We will be back on the 27th, tired but replete with sunshine. The Cinque Terre, or five lands do not have much in the way of tourist sites. They are the tourist site. The five coast hugging Italian villages feature brightly colored townhouses, residential streets made up of nothing more than a flight of stairs, beautiful coastal trails, and tight picturesque beaches. In July of last year they were also hot as blazes and ought to have been uncomfortable, but the narrow shady streets, and cool ocean made up for the heat. Oh, and there was gelato too, lots of handmade gelato. We visited the four villages actually on the coast, and dipped our toes in the water at more the one beach. We also climbed innumerable stairs just for the fun of climbing and looking down. 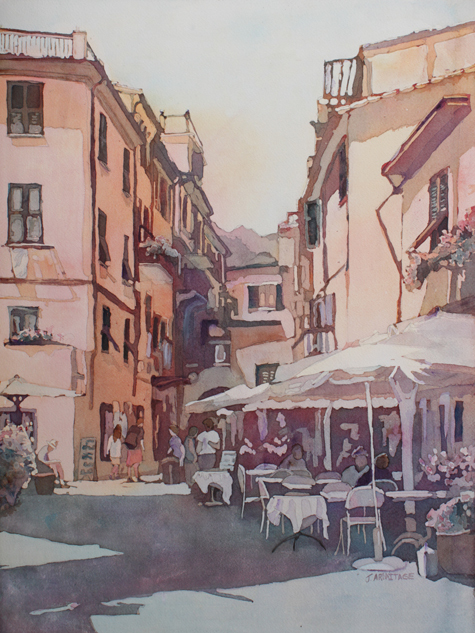 This painting is of Monterosso, the largest of the five, and the one with the widest flattest beaches. We stopped to sample the gelato at the cafe. We ate it while watching our girls play in the warm surf. When we travel, we Armitages climb things. In Paris we climbed Nortre Dame and the Arch d’ Triumph. But we took the elevator at the Eiffel Tower. We had tickets for the evening we arrived at ten thirty. We choose the evening and only the second platform out of necessity because two of the four elevators had been out of commission all summer. It turned out to be a delightful choice. It was our only nighttime view from above, and such a view it was. The Seine with city lights is a sight to see. The Eiffel Tower itself is a spectacular view at night and we were there when the lights came on. The colors of the lights have changed over the years. When we visited they were predominately gold. The sky was black despite the early rain. The wet lawn and paths leading to the tower added to the effect. Walking to the tower across the park was a plus too. The vista leading up to the tower is grand and seemingly endless. I took the photo for this painting on our way back through the wet to the metro. We didn’t mind standing in the wet to look one last time at Paris’ four legged giant. 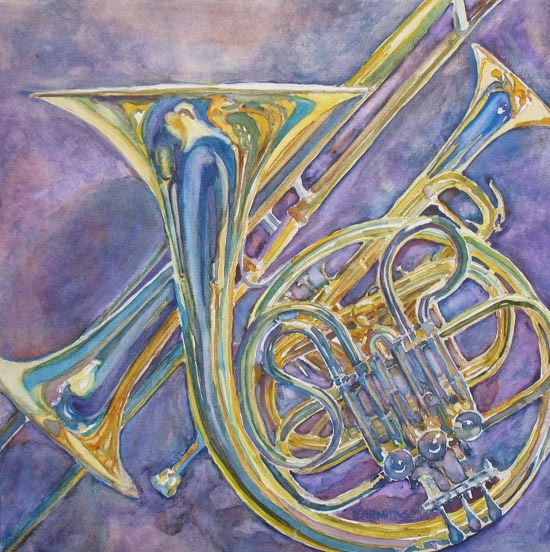 Don’t know what a Flugelhorn is? Neither did I. But I can now tell you it not only looks but sounds gorgeous. Imagine a smooth buttery trumpet and you won’t be too far wrong. 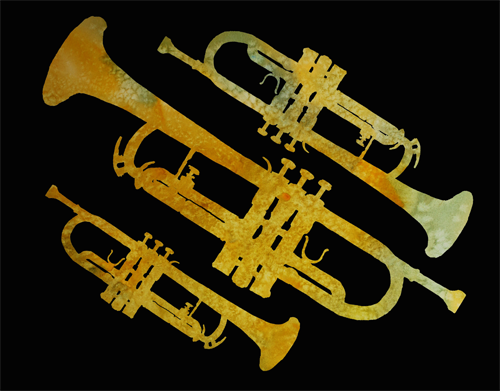 This particular Flugelhorn (and the silver trumpets too) belongs to Mac McGowan of Faerrabella. Faerabella is a fabulous jazz trio consisting of Dana McCarty (vocal), Paul Marche (bass), and Mac (flugelhorn and trumpet). The sound is swing with a dark alternative rock feel to the lyrics and phrasing. The songs are all original. Dana’s voice is nothing short of luscious. Click here to hear them play. If you like what you hear, Amazon has their first CD here. Mac was kind enough to lend me his horns for half hour or so at the Oregon State Fair where the trio treated us to a couple of fabulous sets. 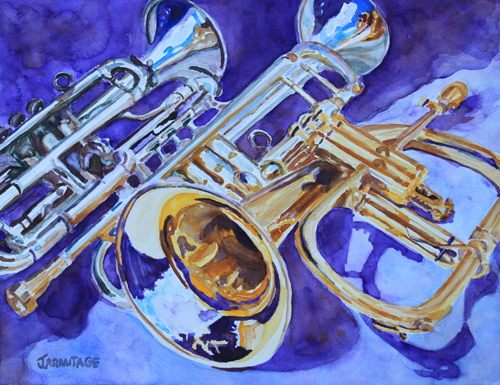 This is the first of what I hope will be several Flugelhorn paintings. Mac’s brass is beautiful and a joy to paint. One of these days I’d like to paint the whole band. Painted on Aquaboard and finished with clear satin polymer varnish, this painting may be framed without glazing like an oil, or matted and framed with glass like a watercolor on paper. 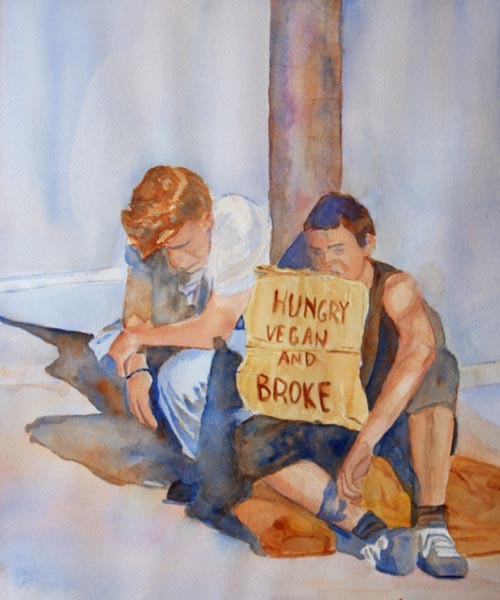 This painting has sold, but you may purchase a fine art print. 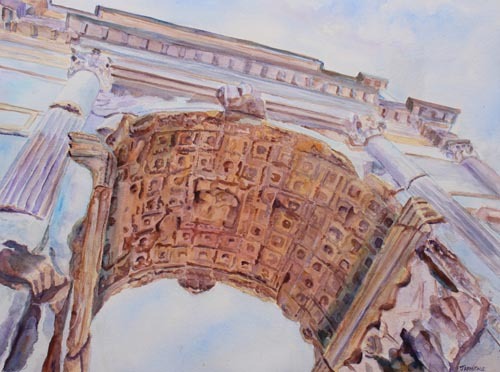 I knew I wanted to paint the Arch of Titus before we ever got to Rome this summer. I remember being struck by it on our honeymoon, eighteen years ago and when I remember an object that long, it simply must be painted. But eighteen years ago, things were simpler. Eighteen years ago in September my husband and I felt as if we were alone in the forum. We walked under the arch and touched the carved stone. 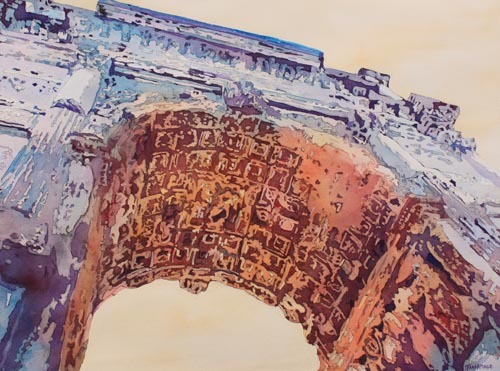 This summer in July the forum was mobbed and the arch was surrounded by a wrought iron fence. 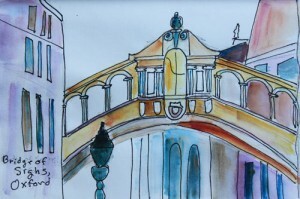 The painting I had in mind, featured tourists walking through the arch. Obviously, that painting, no longer reflects reality. So instead, I shot the arch looking up from below, avoiding the ugly iron fence. This turned out to be a challenge. 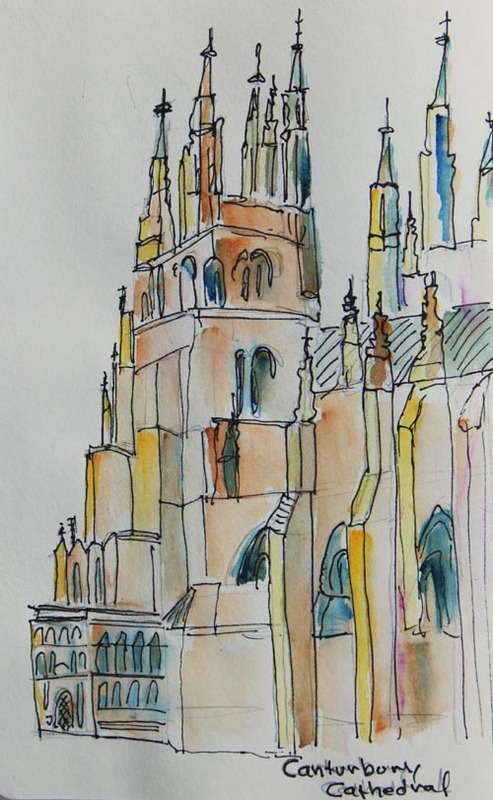 I like the striking steep upward angle, but perspective is difficult to pull off. 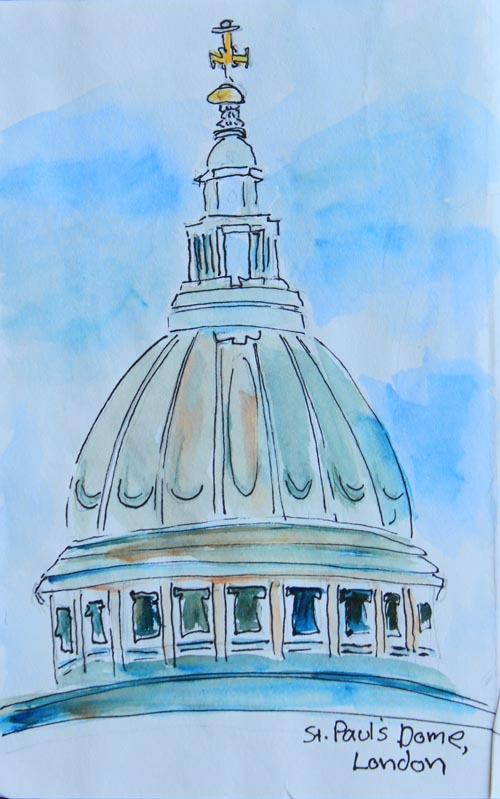 The fact that that exterior of the arch is a light blue marble and the interior a warm yellow orange didn’t help as it made the shadowed underside warmer in color than the cool exterior. But more difficult yet, the upward angle exposes intricately carvings covering the interior ceiling of the arch. I began painting the arch and quit four times, each time simplifying the arch a little more. The second to last attempt I used to demonstrate painting at the fair. The result is good, but it didn’t have quite the oomph I was looking for. So I simplified even further and poured the painting. (For a description of pouring click here). 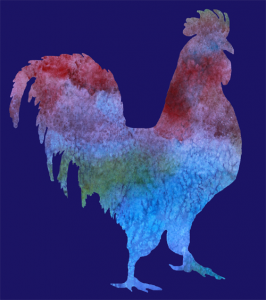 The result is more richly colored and much more graphic. These young men are real. I swear. I couldn’t make “Hungry, Vegan, and Broke” up. I saw them in one of my favorite places to people watch—outside of Powell’s Books. 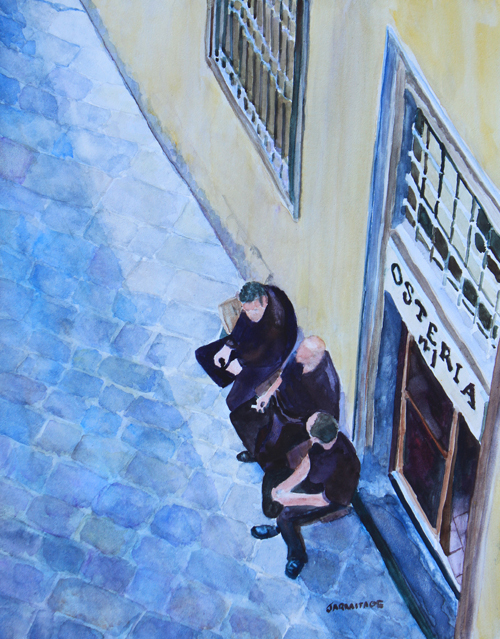 It was a hot, hot afternoon, and they looked just as hot and tired as they do in my painting. But the sign was absurd and their shoes expensive, so I don’t think they were in much danger of starving. I came right home to paint them. My youngest daughter came home from school to find me almost finished. “Why are you paining those men?” she asked turning up her nose. Her reaction was a foreshadowing of all my friends and family. So several, months later I downplayed this painting when I had my first show. 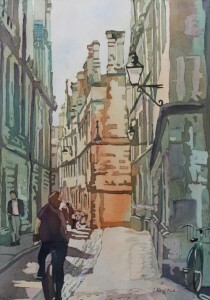 It didn’t sell, but it got more positive reaction than any other painting there. 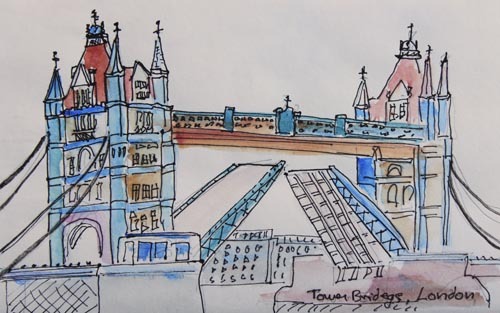 It is one of my best selling greeting cards and it doesn’t do badly in prints either. Everyone smiles. Today Redbubble , a print on demand service, featured it on their homepage. It would be Redbubble, they like the quirky and the edgy. Cards and Prints are of course available through my Redbubble page. 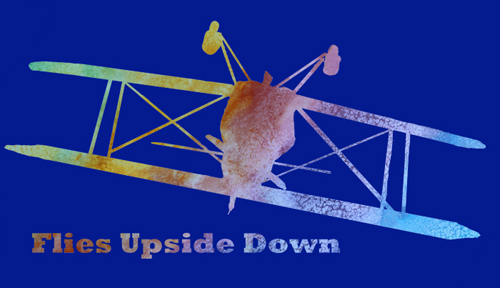 T-shirts are also available through Redbubble. Or purchase from my Fine Art America website. This restaurant was below our apartment in Florence, Italy. Early every evening the waiters gathered to shoot the breeze and smoke while waiting for the dinner rush to begin. I liked the way their black clothing stood out against the stucco building and flag street. 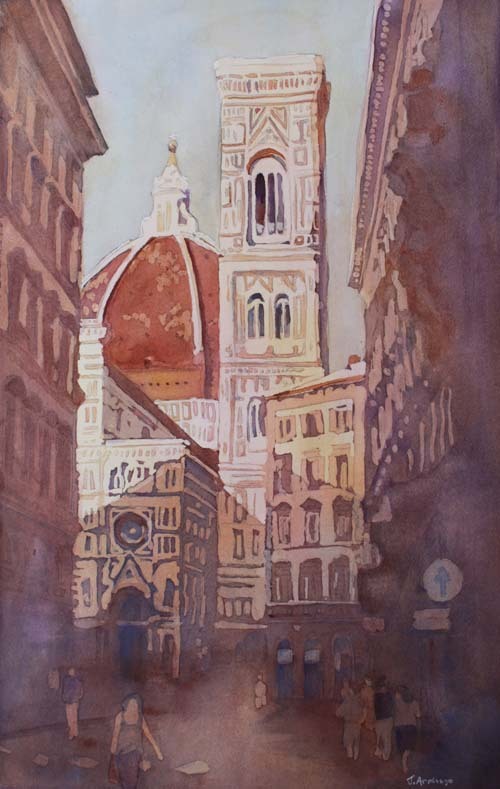 The street is typical of Florence, narrow, flagged in uneven stone, gritty, and full of life. Painted on clayboard and coated with a clear polymer varnish this painting may be framed without glazing like an oil or acrylic painting or matted and framed behind glass like a watercolor on paper. I haven’t been painting as much since December. The reasons are various, but all related to our basement flooding. The water was only about a half inch deep anywhere, but it got a whole number of boxes and other things left by the previous owners wet. So rather than letting it all mold, we had to actually clean out the basement. Don’t feel too sorry for me though. It didn’t take me the last two months to clean out the basement. But once we had all that basement space cleared out and organized we could use it for other things. 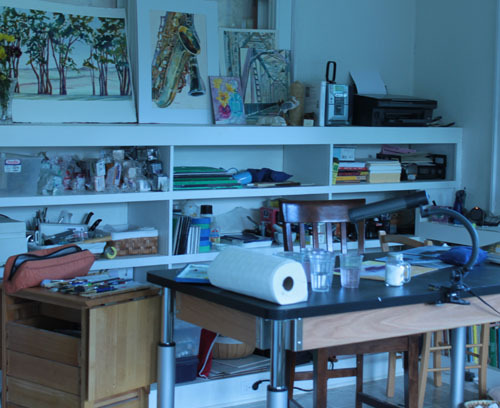 That meant I could separate many things from my studio space. I was able to move my sewing stuff out of my studio and into the basement. Many art supplies I only use once or twice a year moved to the basement too. And then momentum took over. . . .
We had always planned to move my studio into the sun-room, when the girls no longer needed it as a playroom. Now we actually did it. 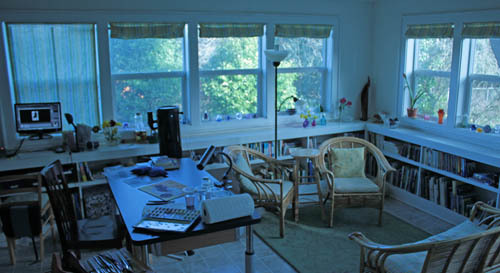 A new table and many trips up and down the stairs (not to mention trips to Goodwill with toys), my studio is now in the sun-room. I splurged on the table. It’s designed for science labs and adjusts from standing to sitting height. As I like to paint standing up, it’s perfect for me. My computer fits on what were once toy shelves. A new key board tray slides out from under the shelf, so the computer takes up no floor space. The new space is not only efficient and light, but spacious enough to hold wicker furniture as well as well as work space. So it feels generous and spacious. My family is happy too, as my old loft studio is now computer, homework, and board game space. 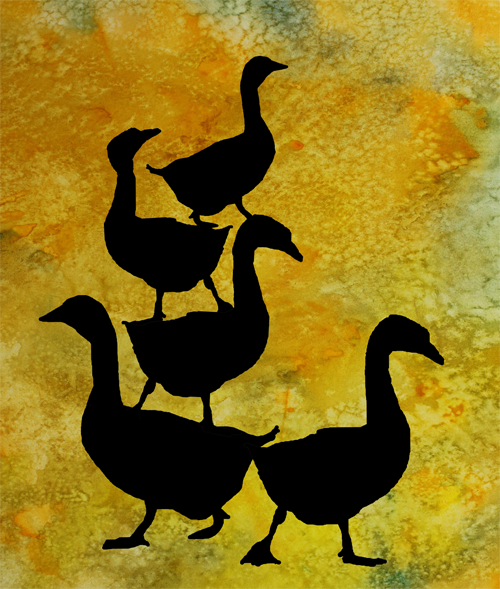 This work is a combination of silhouettes I drew with the mouse in Photoshop Elements and watercolor backgrounds photographed and manipulated with Photoshop. This kind of computer drawing and collage is incredibly fun to do. But, while fun, comparing this kind of work to making paintings is like comparing candy to a full meal. It’s quick and fun, but doesn’t lead to the same ultimate satisfaction. However I did learn some valuable skills, including how to do my value sketches with the mouse. More importantly, one kind of art inspires another. 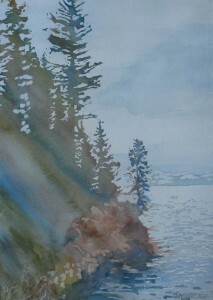 The image for mugs above, is my inspiration for this latest painting. 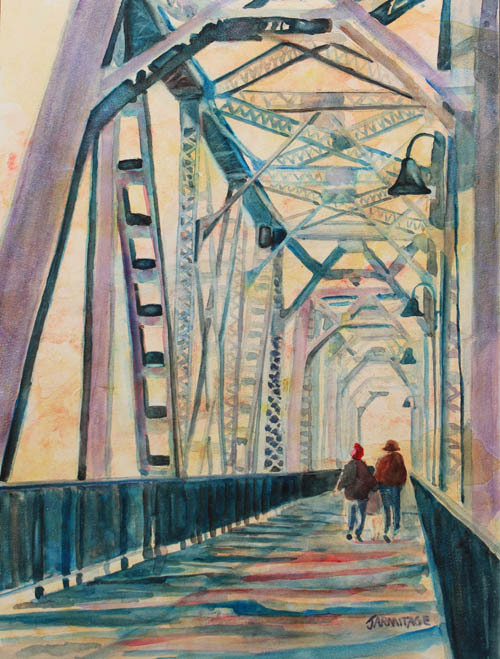 This painting has sold, but you may still purchase a print at my print shop. The results of all this repainting have been what I think are often better paintings, though not better in every way. Practice makes perfect is of course part of this equation. But beyond that, looking at the finished work allows me to make serious design choices. In “Big Boy” the idea was to make the tuba very large by looking up into a sky dominated by tuba. In “Ompa Rainbow” I wanted to make the colors pop. 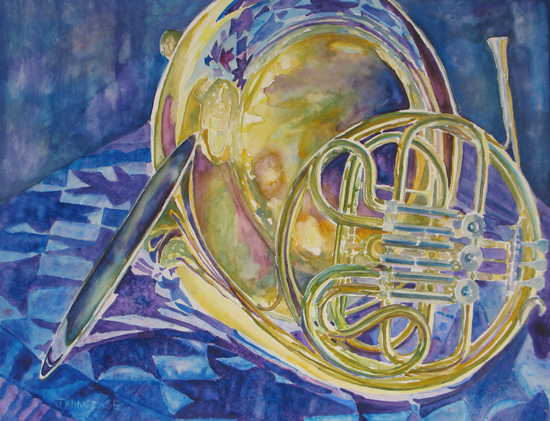 I slid the tuba to the left to give it some space around the bell, but the big change is in the background. “Big Boy” is set against a blue background, resulting in a very cool painting, all blues, greens and yellows. To make those cool colors really pop, I gave “Ompa Rainbow” a very warm background. I also paid attention to color theory. At the top, where the tuba gets blue the background is blue’s compliment, orange. At the base, amidst all that glorious plumbing, the background becomes purple the compliment of the predominating yellow. 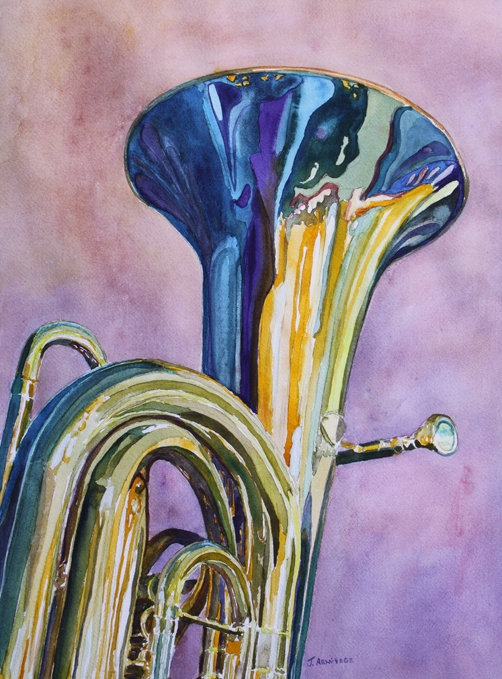 It’s a very warm red leaning purple though because red sets off green which is the other color sharing dominance in the lower half of the tuba. 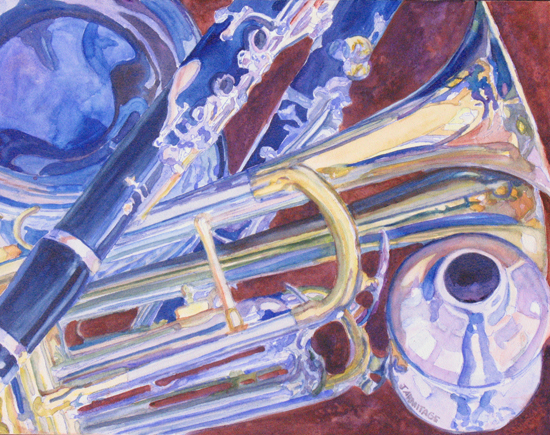 I made several deliberate changes when I repainted “Brass Wind and Shadows” as “The Color of Music”. First, I backed up on the subject a little and allowed all the trombone bell to show. The colors are deliberately brighter. I lightened up the shadows. In retrospect I like the lighter brighter colored version better but I think the tighter crop of the first painting works better. 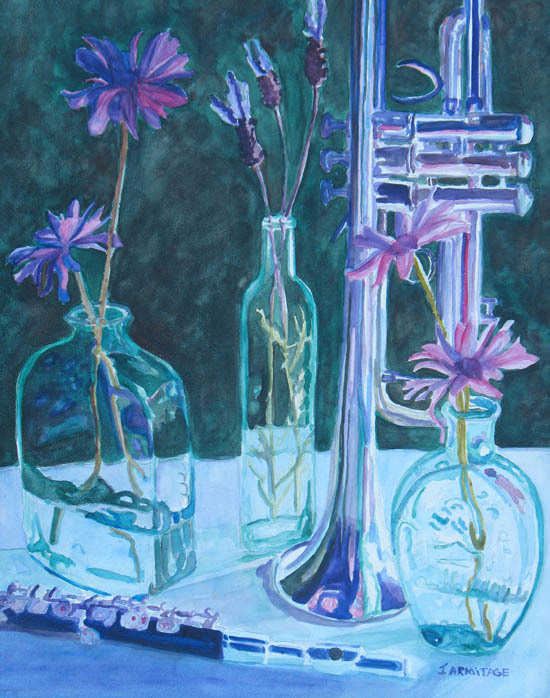 I did very little to the composition when I repainted “Bouquet of Reeds” as “New Orleans Reeds,” but I did deliberately change the mood by intensifying the colors. I also reversed the basic value plan of the painting by making the background light rather than dark. I’m not sure I like either painting better. It’s the mood, not the quality that changed. 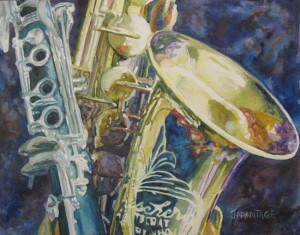 With “Jazz Buddies” and “Taking a Shine to Each Other” the later is to my mind a much better painting. 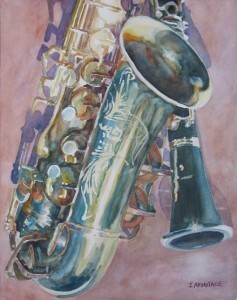 With “Jazz Buddies” I intended to really show off the way the bright sun washed away the sax. I think I accomplished that. With “Taking a Shine to Each Other” I went for drama and I got it by really darkening up the instruments and complicating the dark colors. Prints of “Ompa Tuba” and the other paintings shown in this entry, are available through my print-on-demand shop. 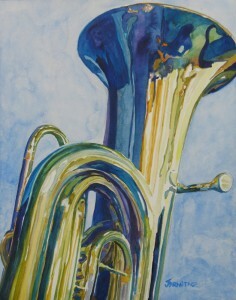 My instrument show, “The Sound of Paint” opened Today at Art in the Valley, and continues through the end of November. 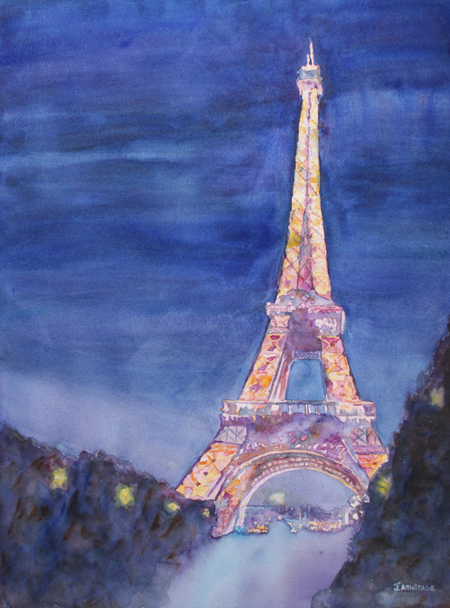 Reception Thursday, November 3rd at 5:00 pm. I hung the paintings Sunday and I’m very pleased with the way they look. In addition to the instrument paintings, there will be a selection of matted original watercolors and a selection of my animal sculpture. When I’m showing paintings at the fair, I’m usually locked in my booth. I’m supposed to be demonstrating and I can’t leave the booth empty for more than a few minutes. So when friends and family visit, I take a few minutes to tour the fair. I always manage to see the fine art show, the quilts, the midway, and antique autoland. I also visit some one or two day events. 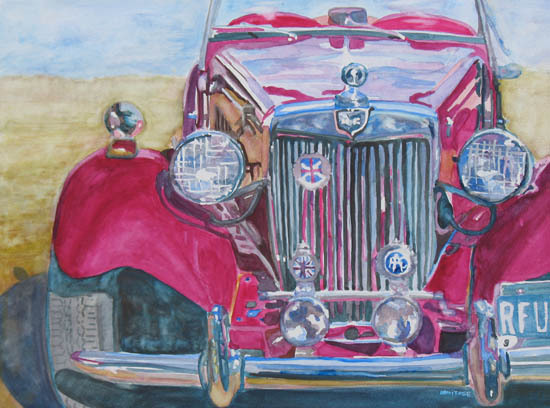 The Classic Car Show took place on the last weekend of the fair. It’s a fun little event. There are cars from the 60s to the 20s and bands playing oldies. This little red car caught my eye, especially the grill and the head lights. Have you noticed I like shiny things? Painted on clayboard this painting my be matted and glazed or framed without glass like an oil on board. 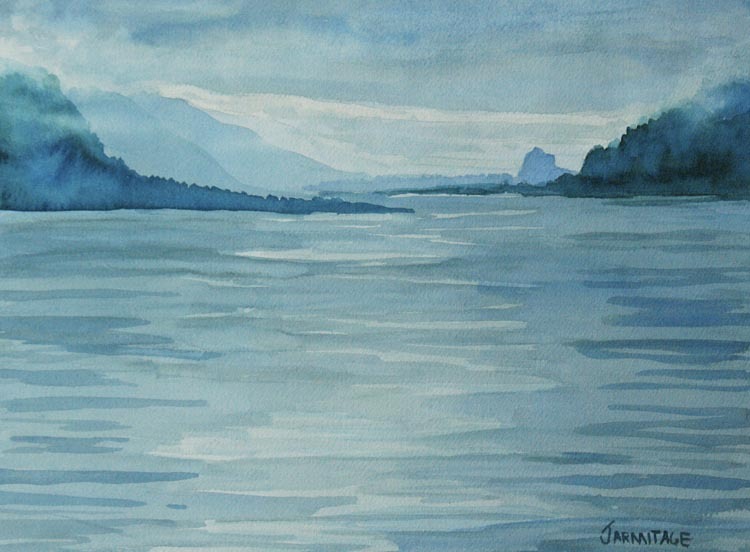 This painting is available through Art in the Valley, Corvallis Oregon. Or purchase a print from my shop at Fine Art America. I began this painting at the Silverton Art Festival and finished it up at the Oregon State Fair. My photo reference is from the same group of photos I took for Silver and Glass make music. But I wanted this painting to be more dramatic, so I darkened the background to make the light more obviously artificial indirect lighting. Painting outside in the heat on aquabord was an challenging experience. Most of the time I was painting the temperature was over 90 degrees and it was very dry. The challenge was to keep the board wet enough to work with. I brought in a spray mister the second day which helped considerably. I used cardboard pieces as a shield to keep from misting the parts I didn’t want wet. Painted on clayboard and finished with a clear acrylic matte varnish and mounted on a black cradle frame, this painting is ready to hang. 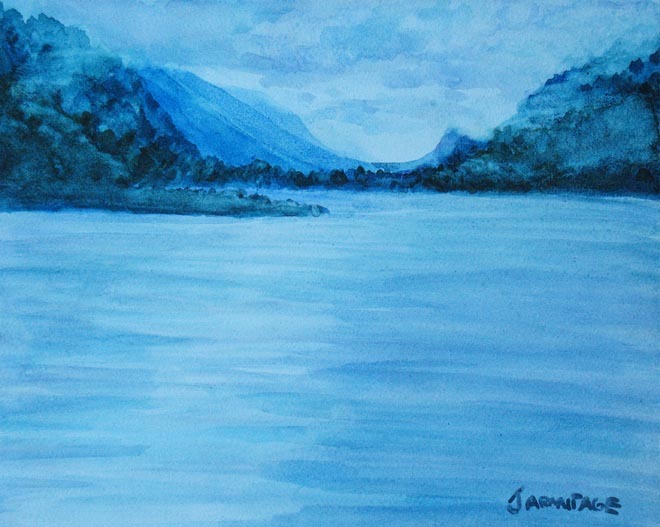 Alternatively, it can be framed like an acrylic or oil painting. Prints are available through Fine Art America.com. The is another painting from my photo session at Weathers Music, but I painted it on the patio of a beach house just outside Sarasota on the Gulf of Mexico. 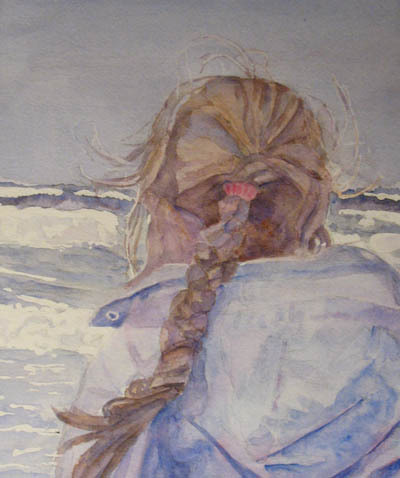 Painting under an umbrella with the ocean just yards away–what could be finer? We spent the last week there getting our fill of salt and sun. After the long wet cold spring here in Oregon the sun sure felt fine. But my is it hot and humid there. I spent the afternoons painting in the cool. I have five new paintings to post over the next few days. This is the first one I did. 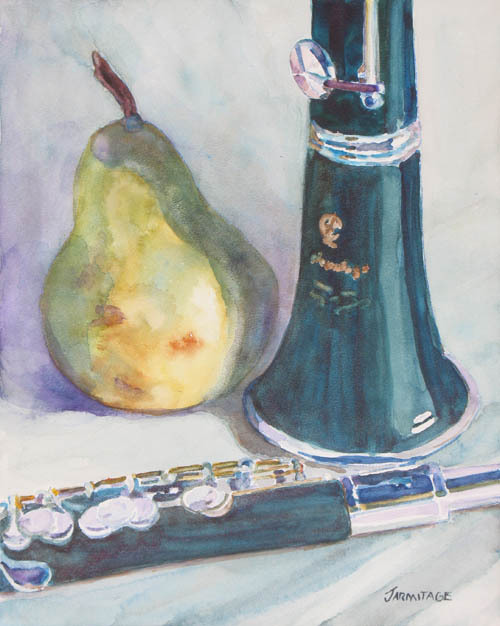 I really like the greeny black of the clarinet and piccolo in contrast to the greeny yellow of the pear. The pear and clarinet bell shapes echo each other nicely too. Another painting on clay board, the painting is finished with a clear coat of acrylic and mounted on a black wooden cradle. 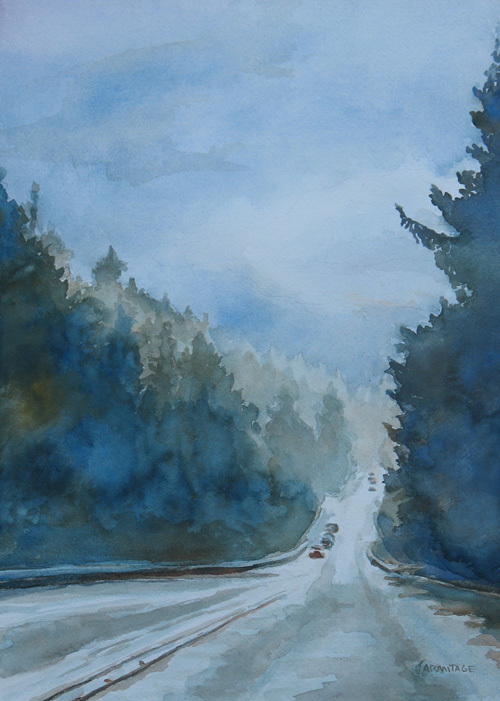 This painting has sold, but you can still purchase a print through my Shop at Fine Art America. 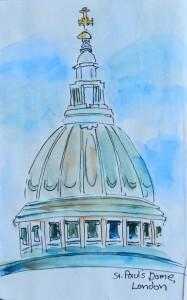 I painted this one specially for Salem Art Association’s Salon: Art2 exhibit. All of the artwork in the exhibit must be 16 x 16 inches inclusive of frame. I had to think carefully how to meet the size requirement. I didn’t want to fit a watercolor on paper into a 16 x 16 inch frame since the artwork would end up being 12 x 12 at most. I didn’t have any 16 x 16 inch aquabord either. So I stretched watercolor canvas over a 16 x 16 inch frame and gallery wrapped the edges. It has been quite some time since I tried painting on watercolor canvas. Paint lifts from watercolor canvas even more easily than it does from clayboard. The surface feels like a cross between clayboard an yupo (a plastic paper) to work on except that the unlike board or paper the canvas gives a little to the brush. I like the canvas’ linen texture, but I’m not sure I like the painting experience as much as the board, though that may be just a matter of getting use to the new surface. This painting has sold, but prints are available through my gallery at Fine Art America. 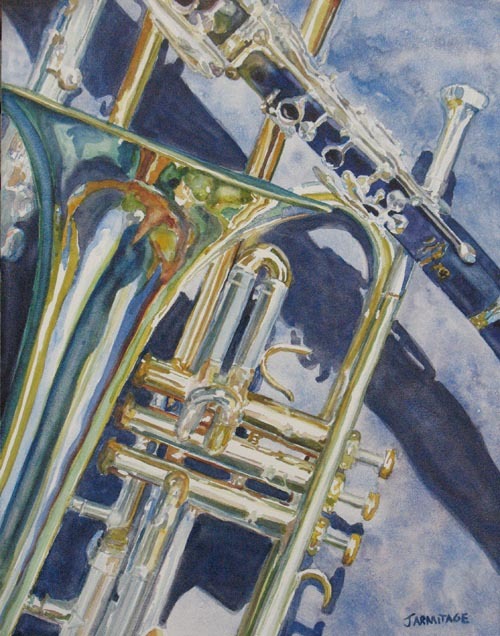 If you have been watching this blog of late, you know I have become fascinated with painting bright shiny band instruments. I had been renting loaner instruments one or two at a time from a shop in Corvallis. But renting instruments, especially expensive instruments for just a month at a time, makes instruments shops who rent to sell nervous. 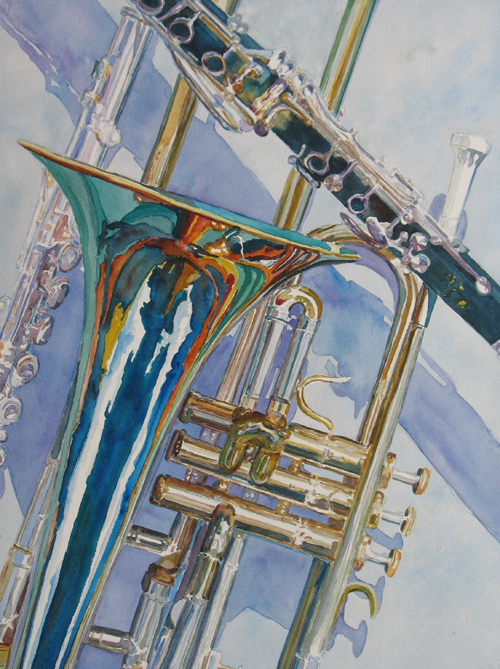 So I was afraid I had come to the end of my supply of instruments to paint. But a couple weeks ago I got a brainwave. Weathers Music, here in Salem, has a recital room that sits empty most days. So I thought maybe I could talk them into letting me rent the instruments and the room at once. That way the expensive instruments need never leave the shop. I gathered up two of my recent instrument paintings and went to ask. I had dressed nicely and rehearsed a little speech about how I would use the instruments for art, and how careful I would be with them. I never got more than three sentences into my little sales pitch. Keith Weathers simply said, “yes.” And the very next Friday I had the use of the Bach Room, from ten to five and an almost unlimited supply of instruments to photograph. I brought quilts, fabric, crystal, flowers, and fruit. I also brought my studio lights. By eleven o’clock I had everything I’d brought in and Keith had gathered me a whole little band to play with. I had three saxophones, a clarinet, a piccolo, a brass trumpet, a silver trumpet, a violin, a french horn, a trombone, and a tuba. I spent a magic afternoon setting up and photographing one still life after another. I spread cloth, arranged flowers, climbed on chairs, moved lighting, and toted instruments back and forth. At the end of the day I was exhausted but happy. I also had over five hundred photos on my camera chip. 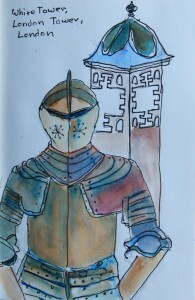 Since then I’ve been too busy painting to post blogs, a sorry state of affairs for which I apologize. So here is the first of many more instrument paintings. 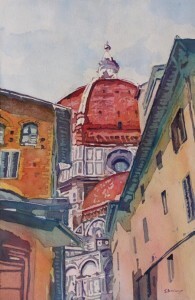 This painting has sold, but you may still purchase a print from Fine Art America.com. No, it isn’t more instruments, but I’ll get back to those shortly. 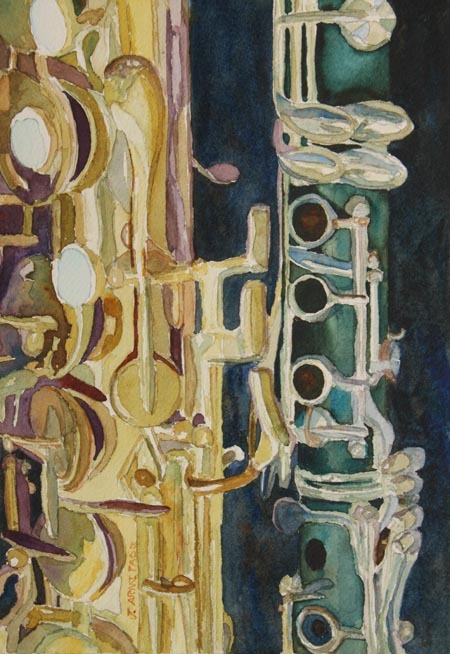 I painted this one at the gallery just after finishing “Jazz Buddies.” I love painting all the keys fittings on the sax, but it tiring work and I was no fit state to start another complex instrument painting full of reflections and reflections of reflections. So I painted nice simple fruit instead. I took the reference photo while I had the mirror out for instrument photos. 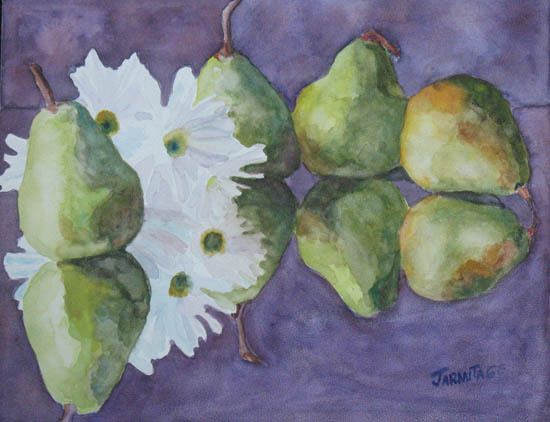 The pears and daisies were intended to be co-stars (and they probably will be in later paintings) but the looked so nice and fresh that I took a few photos of them by themselves too. I’m glad I did. Painted on claybord and mounted on a black wooden cradle. Ready to hang. Available through my Esty shop or purchase a print through Fine Art America.com. This is the first in what I hope will be a series. It all began a couple weekends ago when I was taking pictures in Corvallis. The instruments in the window of Gracewind Music caught my eye and I snapped a few pictures inside. All of that shiny brass made me want to paint. 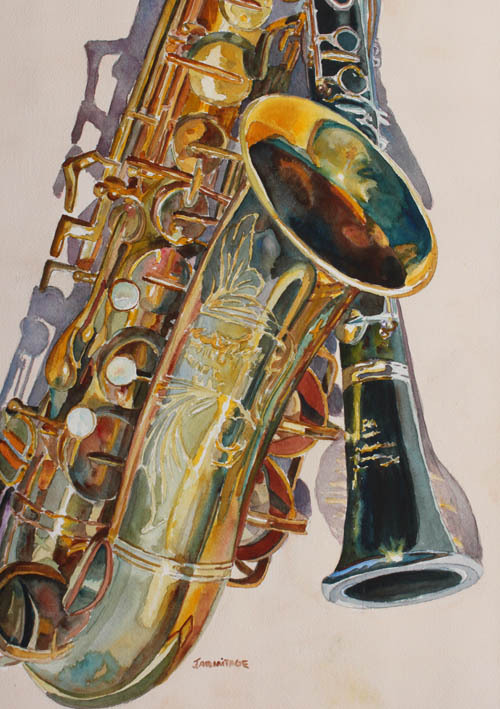 After wondering around admiring a little, it occurred to me that the bread and butter of many music stores is student rentals and that I might not have to buy the instruments to paint them. After some negotiation I left the shop with three instruments of dubious music merit, a trombone, a flute and a trumpet which had been marked “for display only.” None of the instruments is is great condition, but they are all pretty and shiny. And a month’s rental of all three cost me less than what a single month’s rental of just one playable instrument might come to. I have since borrowed a clarinet and a bells from a friend’s daughter. Last week I took a whole series of photos of the instruments on a 42 x 64 inch mirror we had down for a remodeling project. Spread out across the floor it added an intriguing double take on the instruments. I got out some of my blown glassware, a couple of silver vases, some fabric from my quilting collection, and mat boards for background a and began shooting. The guys doing the remodeling must have thought I was losing my mind, but I had fun. 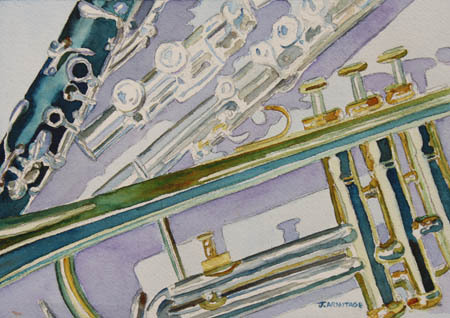 I painted this first one looking down at the instruments from above. However, the white ceiling reflected in the mirror did not provide the best background, so I painted in a dark reddish brown to set off the lighter instrument. Mounted on a black wooden cradle and ready to hang. My eldest daughter learned to spin last year and the Oregon State Fair. She came home with a drop-spindle and proceeded to spin several pounds of wool within the week. 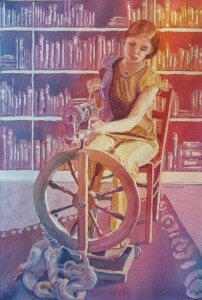 The obsession continued and all she wanted for Christmas was a spinning wheel. We obliged. Since then, she spins whenever she sits down to talk or watch TV. It’s a good thing the wheel is beautiful, because it’s become part of our living and family rooms. Naturally, as I think both the wheel and the girl are lovely, I had to paint them together. As she also writes I thought a background of our family room books was appropriate. The painting turned out to be more difficult than I anticipated. I began with the pouring method, a process much like batik involving multiple masks and literally pouring cups of paint over the paper. After a day of pouring, I got out the brushes and promptly ruined the painting by making it too dark. So I began again, spending another day pouring paint. I began work with the brushes at the gallery and was very pleased with everything except her face which I though was good, but could be better. So improved it until is was merely okay. And then I improved it some more until it was bad and my paper was damaged beyond repair. But I loved the rest of the painting so much that I began a third time, first pouring and then painting. This time I am happy, and while there are a couple details I might like to alter just a hair, I won’t improve it anymore. I did these three little paintings at the Gallery on Wednesday. My primary purpose was to continue learning to handle clayboard. I had taken the reference photos some time ago and they seemed perfect for the little six by six inch panels I had to work with and they were great subjects for learning technique as they have soft and sharp edges and a full value scale from black to white. 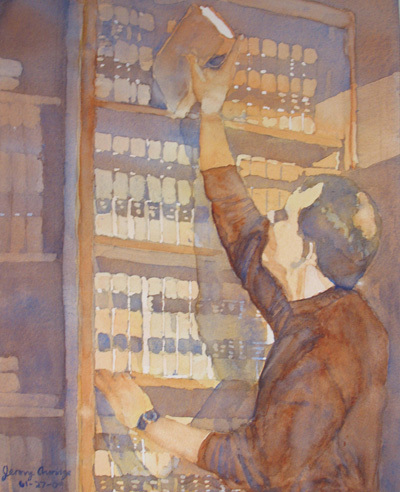 I used the same palette for all three paintings: burnt sienna, red brown madder (much the same color as burnt sienna but much less sedimentary and brighter), cobalt blue, phthalo blue, new gamgee , raw sienna, and because both reds are really orange, dioxion violet. This gave me a highly sedimentary pigment, and transparent pigment for each primary. The transparents, new gamgee, red madder and especially phthalo and dioxion violet are difficult to lift from paper. I emphasized different pigments in each painting. Little Garlic I is all about blues and greens with a little orange-red and orange for punch, i.e. two analogous colors with a touch of each compliment. 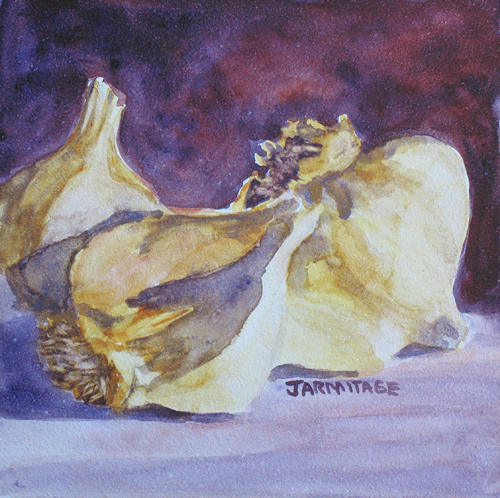 Little Garlic II is a complimentary color scheme, violet and yellow. Garlic III is simply the reverse of Garlic I; orange-red and yellow predominate and blue-violet and green provide the punch. I mixed the colors almost entirely on the clay-board, laying down the warmer colors first and dropping in the cooler ones. 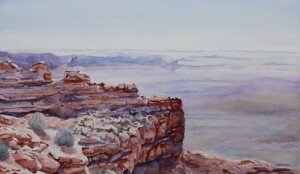 Primarily, I mixed sedimentary colors with sedimentary colors and transparents with transparents. Mixing transparents with transparents and translucents with translucents is another trick I learned from Karen Vernon. Droped into thier own kind, they spread out nicely. Otherwise sedimentary colors tend to push everything else aside. Because of the ease of lifting from clay-board, I didn’t use mask. The very whitest whites are reserved through negative painting but most of the whites are lifted. All of the soft edged lights in the garlic roots are lifted. After I completed the paintings, I fixed the surface with two coats of Krylon’s UV Archival Varnish, and three coats of Golden’s Polymer Varnish with UVLS (satin). The result is that the paintings may be framed without glass. The coating is not only protective, but archival and removable for conservation purposes. 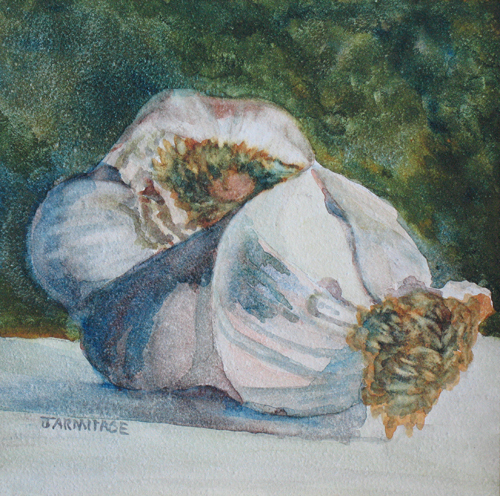 Little Garlic II is still available for purchases. Prints of all three paintings are available through Fine Art America. 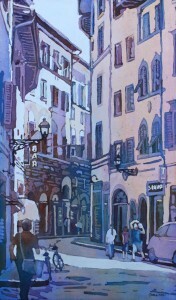 I started this painting in Karen Vernon’s workshop this October. The photo I worked from is hers. The photo showed two mangos and a pear. I broke up the trio by moving one to the mangos to the wall. We spent one of the five days working on color. The lessons aren’t unique, but certainly useful. Color has several properties, hue, intensity, value, temperature. Hue is the actual color. Intensity is the brightness or dullness of the color. Value is the lightness or darkness of a color. Temperature is the warmth or coldness of a color. Blue is the coldest color and yellow the warmest. We spent one one morning working on changing color value without changing any of the other properties. This is not as straight forward as it appears as some colors de-intensify or intensify as they are diluted with water. Adding a bright and warmer hue of the same color will re-intensify a color. Then we de-intesified the colors at each value. As I discussed earlier in a blog about gray, the way to deintensify a color is to add it’s compliment. Red and green deintensify each other as do purple and yellow and blue and orange. Colors will appear brighter next to their compliment and next to deintensified color. In the afternoon we discussed the color of shadows. 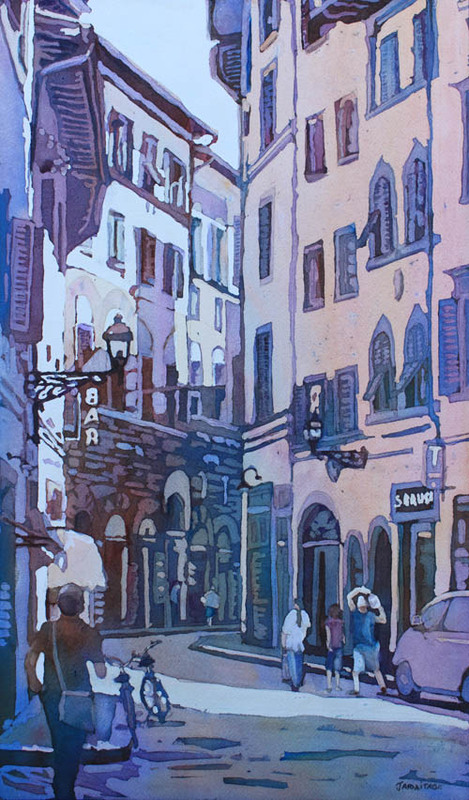 Shadows are generally the deintensified compliment of the color of the object casting them as altered by the color of the surface they fall on. Light will bounce from surface to surface. Thus one object will affect the color of the object next too it. This little painting is a lesson in color begun in the workshop. 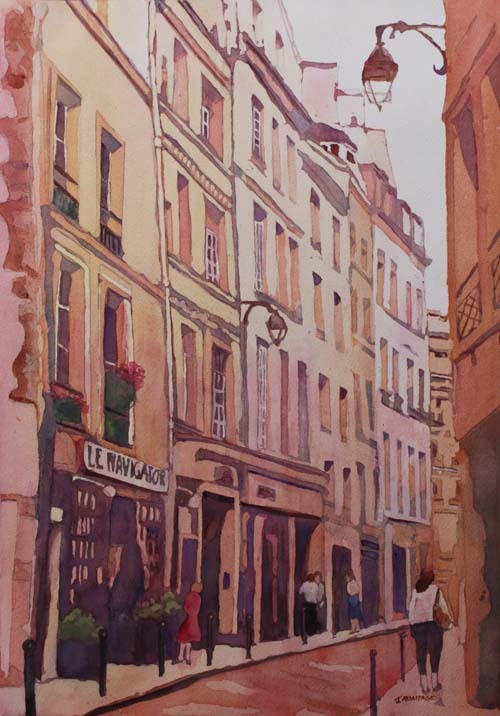 I rarely work from other people’s photos, but this painting began with one of Karen’s photos. The photo showed two mangos and a pear. I moved the second mango onto the wall. 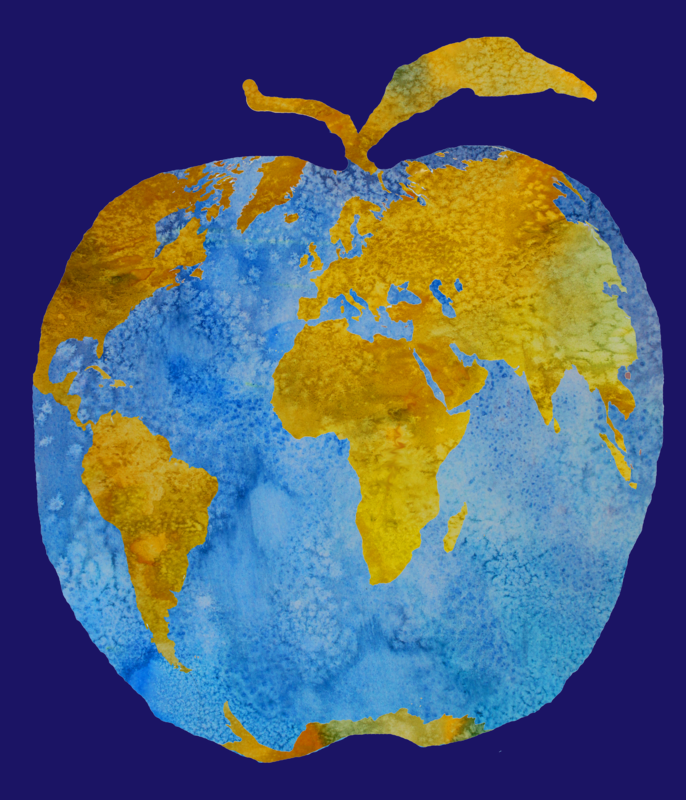 The bright fruit works well for playing with the color concepts we discussed in class. The green pear and the red mango are compliments. Therefore the shadow of each is the color of the other. 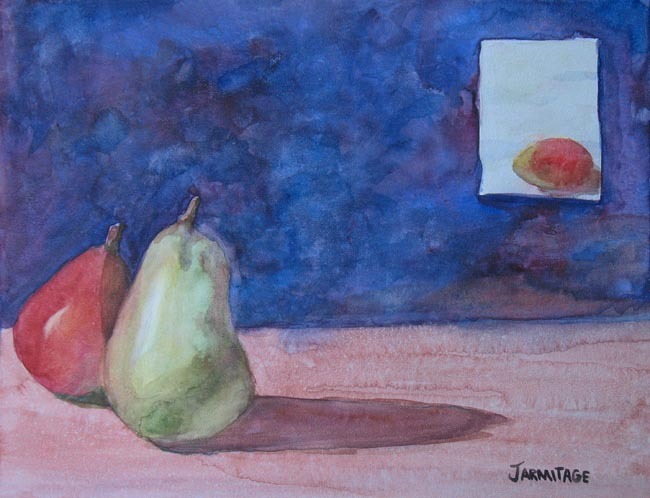 The red of the mango reflects onto the green of the pear. The deintesified floor helps make the relatively intensified color of the fruit pop. The background is almost as bright as the fruit, but it’s darker and much cooler in temperature. Both dark values and cooler colors tend to recede. 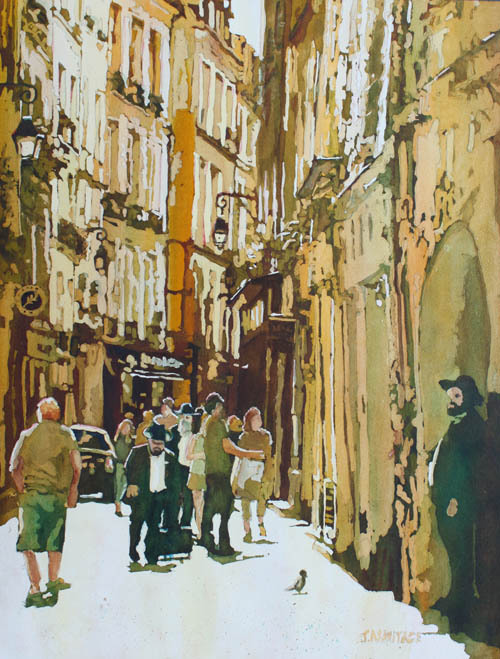 This painting is protected with a polymer varnish and may be framed with or without glass. These are two paintings I did at the gallery in late September in preparation for a workshop with Karen Vernon. Karen, best known for her huge floral paintings on clayboard. My primary goal for the workshop was to learn to paint on clayboard. 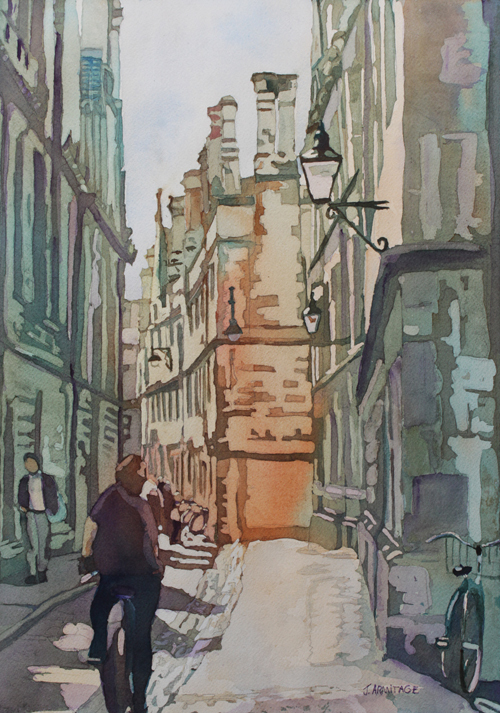 So the week prior to the workshop I painted the same scene twice, once on cold pressed paper and once on Ampersand’s Aquabord. 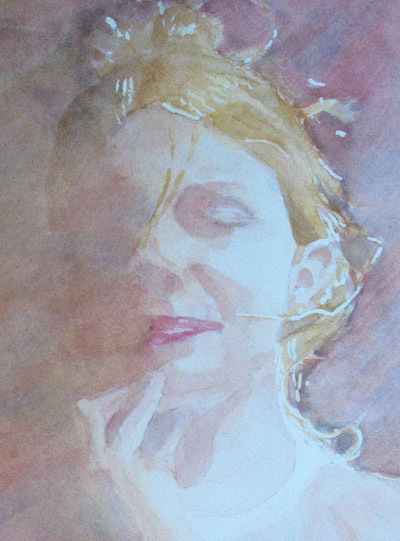 The first painting I did conventionally painting from light to dark and reserving the whites without masking. Some of the fog is lifted, some of it is reserved. I used a very restricted pallet of burnt sienna, cobalt blue, phthalo blue and new gamgee. For the second painting I added dioxon purple to my palette. I proceeded once more from light to dark getting to know the new surface. The first thing I discovered is that the surface has to be bone dry to accept an over glaze. The second thing I discovered is that it’s very hard to lay down an even wash on the clay surface. On the other hand lifting is very easy. Rather than reserved the whites, I lifted them after the painting was almost completed. 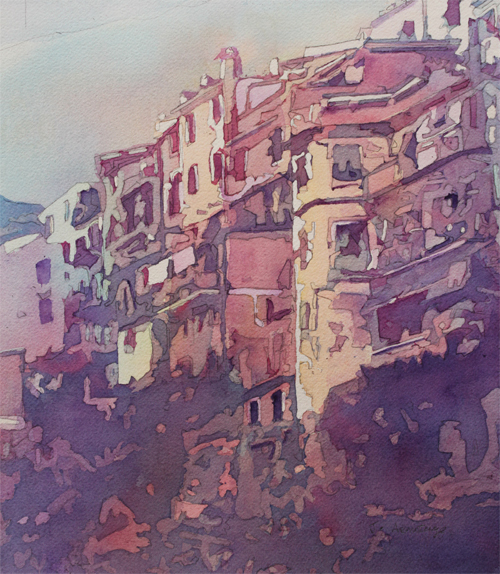 The result is softer than the watercolor painted version. In class I learned that the trick to even washes on clayboard is to saturate the surface and let the water soak all the way through the clay part of the board before beginning. Over glazes require that the board be thoroughly dry. A hair dryer is an absolute must for working with clayboard. The workshop turned out to be a fantastic experience. I will be detailing so of the lessons learned in the coming blog entries as well as posting the paintings I started in class. The clayboard version of the painting is protected with a clear satin polymer varnish and may be framed with or without glass. These paintings are currently for sale on line at my Etsy shop. I began painting it at the Oregon State Fair this summer. When the light got bad in the evening I switched to clay and propped the painting up behind me. It caught the attention of a lovely woman and her teenage daughter. It reminds them of a ranch they know. After much discussion she bought another two big sky paintings and asked to purchase this one on completion. Last week she saw the completed painting for the first time and bought it. I’ve never been quite so pleased with a sale.Visiting the mountain west this summer, my husband and I toured two American Indian War Battle sites. The first was that of the Fetterman Massacre which happened about ten years before Custer’s Last Stand. The view is from but not of the site of the Fetterman Massacre in Northern Wyoming near Fort Kearney. Fort Phil Kearney was set up in the northern Rockies to guard the Bozeman Trail. The Bozeman Trail (northwest from the Oregon Trail), passed through Wyoming, and on to the gold diggings in Virginia City, Montana. Unfortunately the trail crossed traditional Sioux hunting grounds. Sioux war chief, Red Cloud, vowed to defend the territory. Washington, however, ordered the trail kept open at all costs. In 1866, Colonel Henry Carrington, in command of the 18th Infantry Regiment, was sent to build and garrison a series of posts along the trail. Captain William Fetterman joined the regiment. The Sioux harassed the fort and posts, particularly parties detailed to work outside the fort and those traveling between the forts. Red Cloud and Roman Nose of the Cheyenne assembled several thousand warriors to remove the U.S. Army from the trail. Red Cloud’s plan was to send small parties of warriors to attack the wood trains and lure the soldiers off to meet the main band of warriors. On December 6th, a wood train was attacked by a large party of warriors. When Carrington came out to retaliate he was met by an imposing force of Cheyenne warriors including Red Cloud and Roman Nose. He retreated to the fort, leaving too dead and five wounded. Carrington forbade any of his men to pursue fleeing Indians in the future. As Fetterman’s men approached the the wood train, the warriors began to break off from the assault and flee from Fetterman’s approach. The soldiers chased them up the side of Lodge Trail Ridge. As they reached the crest of the ridge a second party of warriors, swung around on Fetterman’s rear. Fetternan and his men were surrounded by nearly 2000 men. Fetterman attempted to ascend the ridge he had just come over and hide behind the cover of some rocks. But Indians were massing up that side of the ridge too. Within minutes all 80 of Fetterman’s men were dead. Lodge Trail Ridge is now Wyoming State Historical Site. (More information about the massacre, Fort Kearny, and the Bozeman Trail can be found at the official site for The Fort Kearny State Historical Site.) A hiking trail leads along the ridge, and despite the markers and other information about the massacre remains beautiful. This is the view west from the lower end of the ridge. I spent a few hours at The Little Bighorn Battlefield National Monument in Montana. My husband is a sort of pocket expert about Custer’s Last Stand so it was a place we simply had to go if we got within three hundred miles of it. Stephen did show me over the battlefield. Standing on the actual ground makes many contemporary descriptions clearer. Western plains are deceptive. 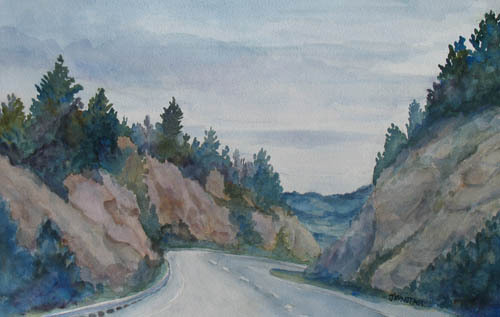 They often look flat from a distance, but turn out to be steep and hilly. People, houses, factories hide in what looks like an unobstructed view to the horizon in a all directions. The battlefield is like that. From the ridge you have the illusion that you can see all, but you can’t. And the land leading up to the ridge is steep and hard. 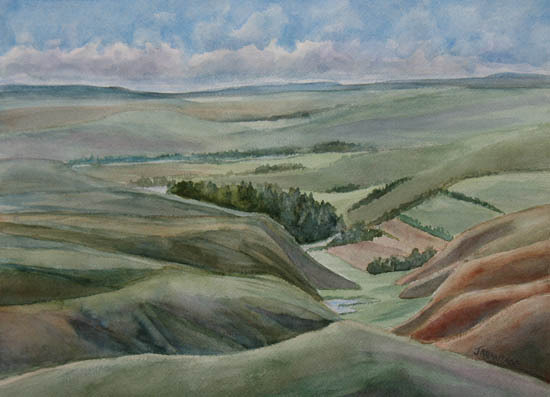 But my painting is not of where Custer made his famous last stand. 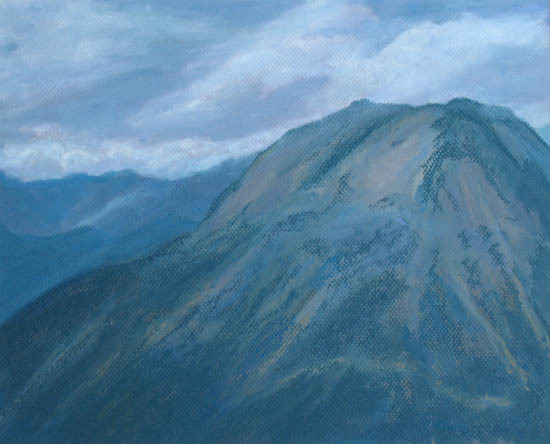 Instead, I painted view from where his Lieutenant Reno was pinned down. Reno retreated up the gulches after meeting the Indians in the valley below. The hills are probably much the same, but the river below snakes through a flat valley and it has moved over time. And of course that fields and ranches now occupying the land came after the battle. Despite the graves, the markers of where Custer’s men fell and where Indians fell, the land itself remains beautiful. Painted on Arches cold-pressed 140# paper with phthalo blue, cobalt blue, cerulean blue, quinacridone deep read rose, burnt sienna, quinacridone gold and raw sienna. Or purchase a print through Fine Art America.com. Can you find my painting? ABC has purchased the right to show “At the Water’s Edge” on Desperate Housewives. It will probably show up on camera somewhere this Fall season. I don’t know when or as part of what set. But I’d really like to know. So, if any of you spots it, please comment here or drop me a line. They have purchased a 12 x 16 inch print on gallery wrapped canvas, so it could appear framed or unframed. So far it has been a surreally fun experience. ABC/Disney has entered into an agreement with the on-line printing house Fine Art America, to facilitate licensing images for use on sets. Artists selling work through Fine Art America can opt in or out of the program. I opted in and then promptly forgot about it. It seemed much too unlikely. But Wednesday morning I got an email from the design staff at Desperate Housewives. Thursday they arranged for FedEx to pick up the signed license agreement and Friday they purchased the print. The young women who facilitated this has no idea which episode or where. Not surprising really. My husband suggests I add “Painter to the Stars” to my resume. Slight overstatement? Of course. After all picking artwork for sets is akin to picking artwork to go with the sofa. It is fun, but not a critics seal of approval. Prints of the painting may be purchased here. I will be attending a family reunion and touring Wyoming, Montana and South Dakota with the girls for a few weeks. 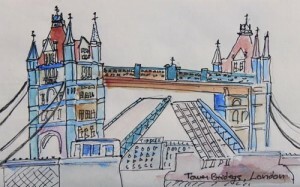 Stephen draws the line at shipping paintings, so paintings purchased before I return won’t ship until after July, 6th. 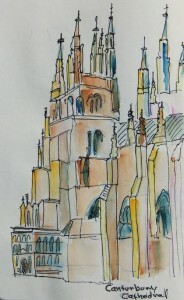 I hope to come home with a pluthera of paintings, sketches and photos for paintings. I am not Ruth Armitage. Ruth Armitage also lives here in the upper Willamette Valley. And she also paints watercolors. 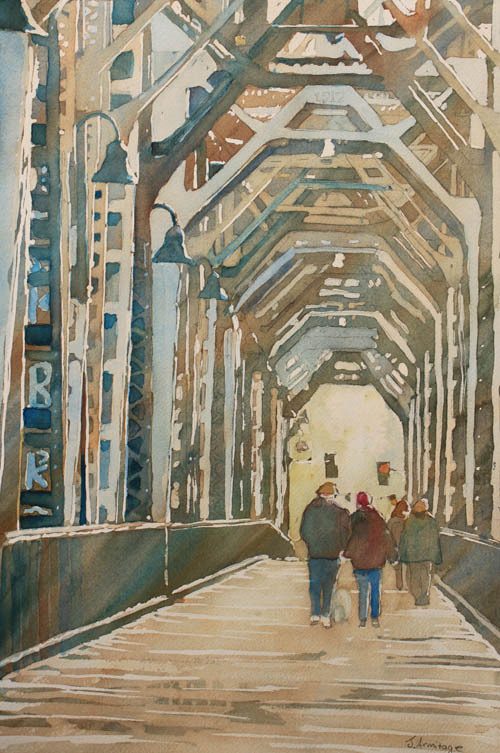 She is a signature member of the National Watercolor Society and a past president of the Watercolor Society of Oregon. Her work hangs in my favorite gallery in Salem. And yes, like me, she likes to paint figures. And in my opinion, she does fabulous work. 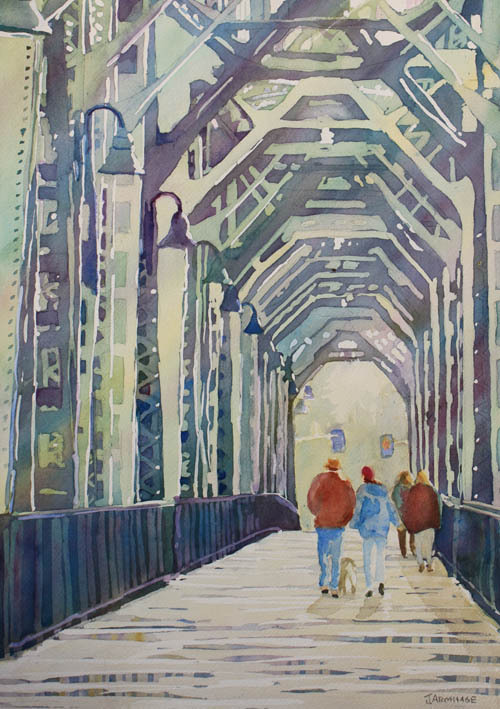 I knew these facts, and yet I was still not prepared for connection, when I displayed a large number of my watercolors at the Oregon State Fair. Apart from, “these are lovely,” and “are you the artist,” the most common comment was, “are you Ruth Armitage?” The second most common comment was, “are you related to Ruth?” Given Ruth’s stature in the Northwest art community, those were flattering questions. But the woman who asked, “then why do you use her name” floored me. Jenny Armitage is my name. 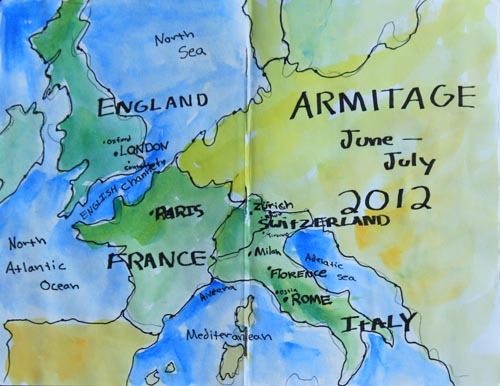 I place a prominent “J” before Armitage in my signature. And while I like her work, my paintings have not been influenced by Ruth’s. Nor, much as I admire her, do I want to be Ruth Armitage. I want my work recognized as my work. Elizabeth Edwards just published an interview with me for First Angel and Friends. I love it. She asks great questions and I had a blast answering them.